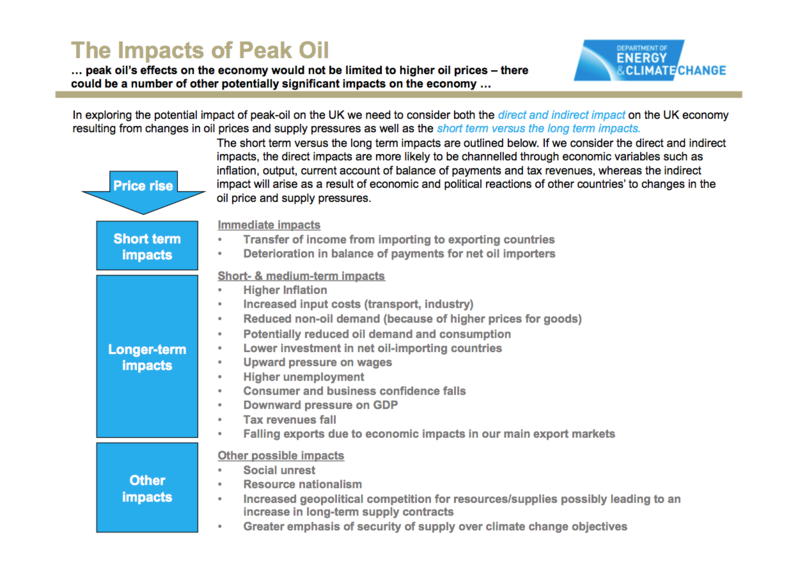 The Guardian has released an internal UK government report on peak oil. Of the 17 bullet points on the slide, 16 have come to pass in the UK and in the neighbouring countries of Europe (click on slide to enlarge and open in separate window). Given that the research was conducted in 2007 and the report compiled in 2009, this conveys amazing insight. Two important items are missing from the list and when these are taken on board, the story is complete. 1. Peak oil may threaten the global banking and financial system since the Ponzi scheme of growth based on credit expansion requires a growing stream of cheap energy to fuel the real economy. When the stream of cheap fuel dried up, the real economy failed, toppling the global fractional reserve banking system that lay at the heart of the Ponzi scheme. Fractional reserve banking has now been supplemented by Quantitative Easing as a means of creating money to drive consumption of finite reserves. 2. Peak oil will threaten pensions since these are based upon the excess net energy produced from high ERoEI energy sources (Energy Return on Energy Invested). As the ERoEI declines and the lifeblood of cheap net energy dries up, it is inevitable that society's ability to care for those not in work (young, old and dysfunctional) will be steadily eroded. This links to point 1 above via declining stock market valuations. It seems that the global economy may be on the rocks again for the second time in three years, stemming from energy prices that society can ill afford to pay.